Da Capo Lifelong Books, 9780738216379, 240pp. Your Primal Body is a book that will transform how you think about your body. Not just another fitness/weight-loss book, Your Primal Body shifts the paradigm for how to achieve a lean, muscular, vibrantly healthy body according to your genetic inheritance. This is the same body your Stone Age ancestors had, expressed through the human genome that evolved over a period of 2.6 million years. It's the body you too can have when you learn how to follow ancestral dietary and activity habits in your 21st century life. Scientists studying the remains of early humans tell us how our ancestors were in far better shape than we modern humans, their bodies free of disease and painful conditions. Natural adaptation and selection occurred over millions of years when they lived in caves, hunted wild game, and foraged for plants and berries to survive—a way of life very different than ours today. But one thing has not changed: our DNA. The human genome has evolved so slowly that our genetic blueprint is almost exactly what it was 40,000 years ago when our ancestors still hunted and gathered their food. Lifestyles may have changed, but our modern bodies are no different in their basic DNA—a startling fact that revolutionizes how we think about and approach diet and exercise. The thesis of Your Primal Body is that we modern humans can follow the diet and activity patterns of our Paleolithic hunter-gatherer ancestors for optimal health and weight-loss. When you do eat and move as they did, you are healthier, more muscular, leaner, and pain-free; when you don't, you run into trouble. The “diseases of civilization”—heart disease, diabetes, cancer, obesity, arthritis, to name a few, are all linked by researchers who study health and longevity to sedentary lifestyles and eating habits. Eating highly processed food and performing minimal activity, you become susceptible to the health problems that plague our modern society—none of which our ancestors had. 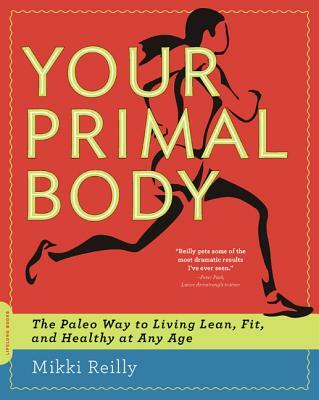 In this book, you will read the argument for switching to a more “primal” way of life and how it is scientifically valid, based in the latest research done by exercise physiologists, evolutionary fitness theorists, and scientists in university laboratories. Your Primal Body goes beyond theory and science to give you a practical plan for implementing primal fitness into your modern lifestyle. In Mikki Reilly's 5 Step Primal Body Program, central to the book, she shares her 20 years of experience in training people from all walks of life about how to lose weight, become fit, stay healthy, and condition their body for athletics. Reilly's clients span a range of ages, from 18 to 74, and the book includes their inspiring stories, along with their “before and after” pictures, placed throughout the text to illustrate the book's points and instructions. Their stories are not fictional composites but actual words of people who got the results they wanted from “going primal,” telling exactly how they did it. The Primal Body approach is not a quick-fix, but a complete overhaul in habits that have been stopping people from taking advantage of their natural inheritance, a fit and healthy body for life. Professional certified fitness trainer Mikki Reilly has been working with clients for 20 years. A one-time competing body builder, she brings her wealth of experience to helping people of all ages lose weight and become fit. A graduate of University of California, Santa Barbara, with a BA in Exercise and Health Science and Communication, Reilly also holds a Certified Strength and Conditioning Specialist (CSCS) credential from the National Strength and Conditioning Association (NSCA) and the Master of Fitness Sciences (MFS) from the International Sports Sciences Association (ISSA). A communication expert, Mikki is also an accomplished speaker and writer, presenting recently on health and longevity at the Santa Barbara 2009 Women's Festival. She has been published in Santa Barbara Fitness Magazine; Med Fit, a personal training trade journal for ISSA; and the Balance Bar Newsletter. She blogs regularly from her website, FitnessTransform.com. Additionally, she served on the Balance Health Science Advisory Board and on MET-Rx's World's Best Personal Trainer Advisory Staff.